Weather-wise still no change from the pattern we have over the last week. Health-wise I started with some dizziness after getting up, which I control with Zofran. Being Monday I am back to the weekday walking routine routine with Dean. Today was a somewhat uneventful day. After our walk we stopped by at Costco and later Grocery Outlet before returning home just for lunch. After lunch I visited Dean and Margret, staying in their backyard, which they have been working on since the start of the year. 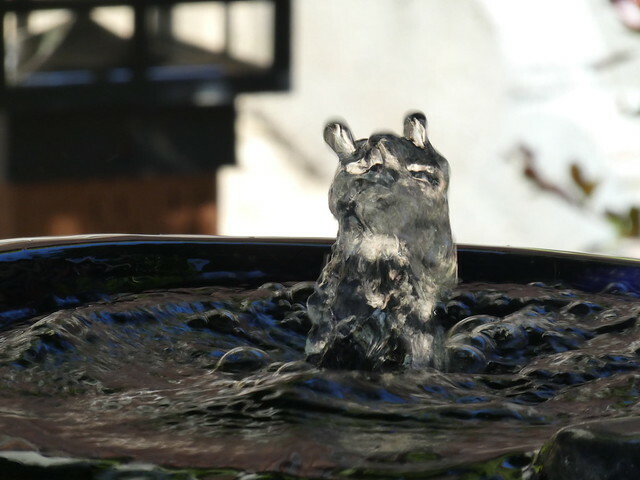 The reason for the visit and staying in their backyard was to shot pictures of their water fountain, following the process outlined in the book Zen Camera. Currently I am following Lesson one, Observation. Last week it was Shooting from the Hip, this week it is Look up. The idea is to pick a subject look at it for awhile, like 30 to 60 minutes before taking a number of pictures. These pictures should be of the things that were identified at the start, when just looking at the subject. You can see the pictures as part of the May Album using this link and looking for Day 7. I return home, walking across the street, about an hour before dinner to work on my to-do list, which was completed in time for dinner. Dinner today was Chinese which was great. Even my fortune cookie was right on; We must overcome difficulties rather than being overcome by them. Afterwards I work on this blog entry which took a long time because for some reason I constant dozed of writing it. I did finally goto it done. That is it for today, in summary, today was a very good day.